You never really know what is going to happen at the farmer's market. I have had good days when it was dreary and overcast and I have had terrible days when it was sunny and beautiful. This being the case, it is easy to always go into a market day with your hopes high, even when there were tornadoes in the area the night before and more in the forecast. As I loaded the car the morning was overcast but no rain, a good sign to say the least. 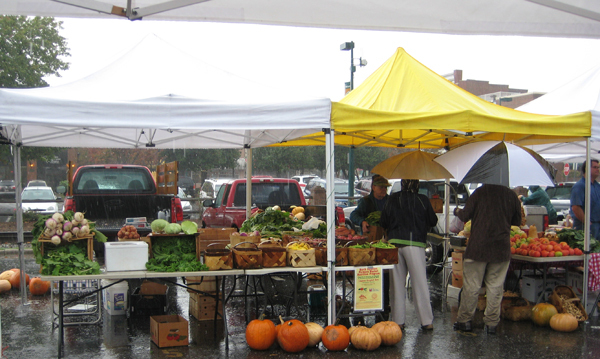 As I headed to Hickory for the market the day continued to be dry if a bit dreary. But as I pulled into the farmer's market to unload a car full of soap that desperately wanted to go home with some native Hickorians (or is Hickorites?) the rain started to fall. I quickly unloaded and parked the car. The biggest problem for us is that soap is best stored in cardboard boxes which are wonderful in almost any situation that doesn't involve water. As the rain continued to fall I quickly realized this was not going to be one of those situations! All things considered it went well. We lost a couple of boxes to water damage but only one or two bars of soap. Below are some pictures of the market and the brave souls who came out to support their local farmers and artisans. The other vendors managed to keep the spirits high throughout the afternoon. 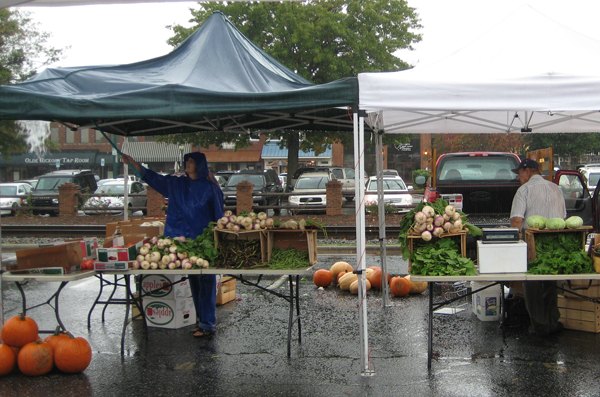 Joanne, our totally awesome market manager, closed the market at 4pm due to another band of angry storms that were headed our way. [caption id="attachment_609" align="alignnone" width="300" caption="Deluge at the Market"] [/caption] [caption id="attachment_610" align="alignnone" width="300" caption="Joanne, the Market Manager, on Tent Patrol"] [/caption] [caption id="attachment_611" align="alignnone" width="300" caption="Market Vendors Staying Dry"] [/caption] The good news...the Saturday forecast is perfect!! !